Is your city among these Top 10 primed for growth in flexible office space? 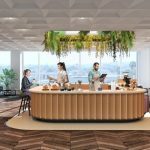 What are the top trends in office design for 2019, and how do indoor plants fit in? What will tomorrow's workplace look like?